Buying used is one of the hardest choices many RVers make, especially first-time owners looking to save money to start road tripping. When you're looking to buy an RV, it can be hard to justify how much money you spend to make it happen. With so many RVs on the market, it can be hard to figure out what fits within your budget. It is difficult to determine if a used RV is in good enough condition to buy at an affordable price at first glance. A used RV can be the quickest way to take advantage of everything it offers your family when traveling. To avoid being swindled by a dealer or individual seller, use our checklist to make sure the RV is in working condition before making the buy. Be sure to do an interior and exterior walkthrough of the RV without the dealer or owner present. When you do a walkthrough with someone else, they'll steer you away from any issues that may be present. By walking through yourself, you can check out things you may not have noticed otherwise. Never, ever buy a used travel trailer or RV without doing a thorough visual inspection. Don’t buy sight unseen! Odors: Especially from water sources or appliances. Check the drains, tanks, and undercarriage storage for signs of odors you can’t pinpoint. Mold: Found in corners of the roof or laminate floors. Make sure to inspect every corner of the RV and look at all seams and creases for signs of mold. Open the cabinets and appliances to look for it, too. Leaks: Often found in corners of carpeting near appliances and bathroom. Leaks can be from the roof, windows, doors, or any other. Awnings: Make sure they work properly. They’re costly to repair depending on whether they retract or not. Roof: Check for cracks, bubbles, or paint splitting from the roof surface. While trailer or RV roofs take punishment from the sun daily, if the roof hasn’t been probably taken care of you may have to replace it. What Should You Do If You Find Issues? 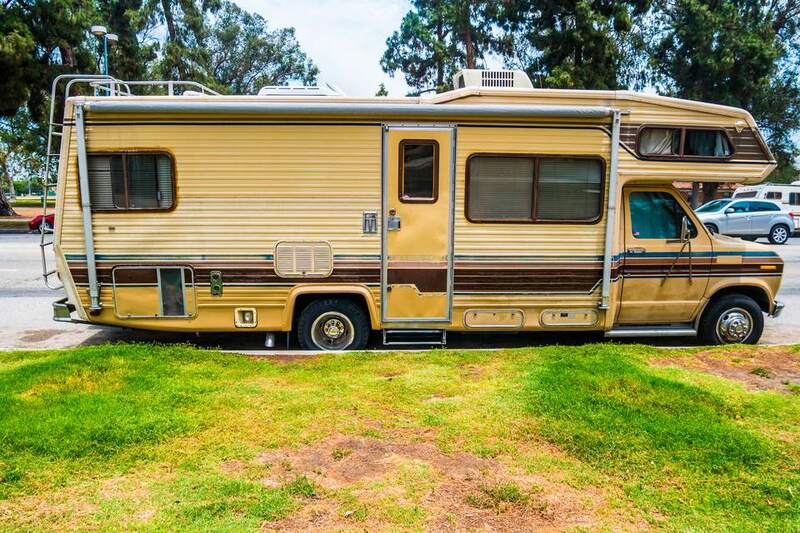 Just because you find any issues with the above list doesn't mean the RV or trailer is a bad buy. There are reasons a used RV is cheaper than a new one, and these issues you find may contribute to that. Depending on the cost of making repairs, it may be worth taking the RV as is and fixing things as can. If you feel you see too many issues and the price is high, this is where negotiating comes into play and can benefit you. Sometimes, though, the amount you’ll spend on repairs plus the cost of the used travel trailer or RV isn’t worth the overall cost. You’ll lose money on the RV rather than stay within your budget. Ask for the full-service record for the RV in question. A reputable seller will have no issues giving this documentation over to you. Be wary if they don't. These records will give you a breakdown of everything that's been worked on, whether it's major or minor repairs and can be an indicator of on-going issues you will handle down the deal with down the line. Pro Tip: Make sure the vehicle identification number (VIN) from the RV matches the paperwork. Otherwise, you're being tricked into thinking the service record is clear of any issues. One of the quirkiest ways to check if the engine is in good condition or not is to look under the hood at the oil. Many dealers and sellers may be aghast to have to do this for you, but again, a reliable one will have no hesitation. If oil from the RV smells like it's been burnt, the engine integrity should be questioned. Look for any signs of rust on the inside or outside of the RV. Rust will occur on any RV, no matter where in the country it's located. You're looking for any signs of rust on the frame of the RV. Repairing a frame after rust damage is costly and not worth the time even for the price a used RV might be. When buying a used travel trailer or RV, you're taking a risk that down the line you'll invest a significant amount of money should something go wrong. If you buy from an individual and not a dealer, you'll often find you're buying a used RV as is with no warranty. As is means you accept all liability for something going wrong the second ownership changes hands. If you bought a lemon, you're stuck with a lemon. Being stuck with an RV that doesn't work or requires more repairs than you anticipated doesn't save you any money and can leave an impression on how fun and exciting you thought RVing was going to be for you and your family. It's imperative you do your research ahead of time, perform a thorough interior and exterior walkthrough of the travel trailer and make sure all your questions are answered ahead of time before you consider making a used RV buy.